I started a new job last month, and they issued me a MacBook Pro — the other choice was a smaller Windows laptop, and since I prefer the *nix environment I chose the Mac. I could make plenty of arguments or even just observations, since it’s been close to ten years since I last used a Mac on any kind of regular basis, but I won’t. Instead I’ll offer a quick tip for those of you who happen to use a Mac, who happen to like Chrome, and who also happen to use a Logitech Keyboard-and-Mouse combo, like I do. I know, there aren’t many of us. For the last few weeks I’ve been frustrated at the lack of back/forward functionality in Chrome. I use it all the time on my Windows laptop at home, and it’s annoying that it didn’t work here. 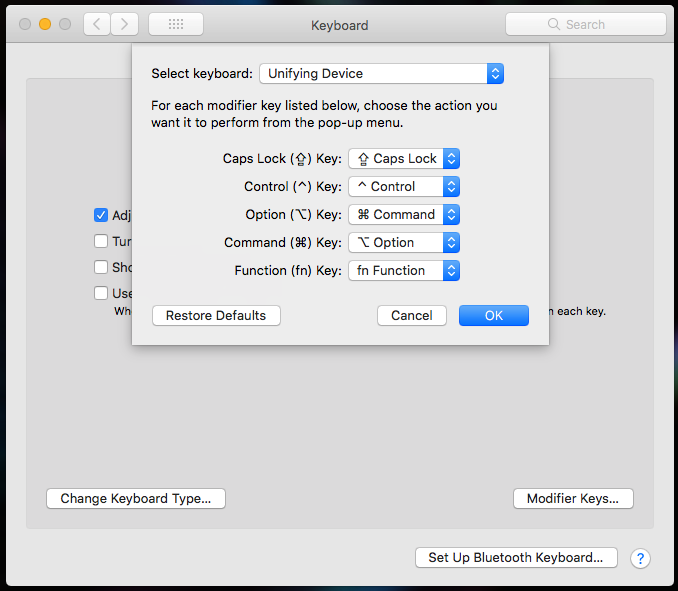 Finally I did some searching, and a few suggestions were to change the action in the Logitech Control center from “Back/Forward” to “Keystroke.” Simple enough, I thought, change the “key” to a ‘[‘ or ‘]’ (back and forward in Chrome, respectively), and the ‘Command’ modifier — piece of cake. Except it didn’t work. It didn’t work at all. It took a few minutes, but I realized I had made changes when I installed my keyboard. Because it’s a Windows keyboard on a Mac, the “Alt” key is in the wrong position. I’ve been through this before using external keyboards on my old personal Mac, and I found it handy to re-map the keys so that they are the same whether I’m using the laptop as a desktop (with extra keyboard) or as a laptop, with the built-in one. So I remap alt/option as command, and command as alt/option. Some of you reading this word-for-word will be a step ahead. 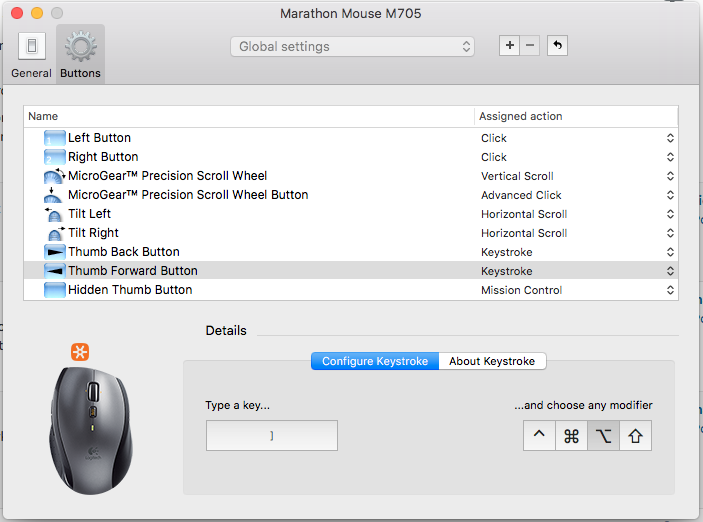 By remapping the keyboard functions, the keyboard keys that the mouse was ‘virtually’ pressing were now wrong. 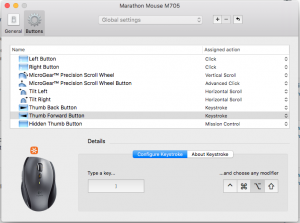 By configuring the “keystroke” to be Option+[ and Option+] the mouse now works correctly.